We began the review of your app but are not able to continue because we need a demo account to fully access your app features. Please provide demo account details in the Review Notes section of the Version Information for your app. Please ensure that the information you provide includes any data necessary to demonstrate the functionality of your app features. We were unable to log in to your app due to no demo account being provided. You can provide demo account information, including passwords, in the Review Notes section of your iTunes Connect App Information. While your iTunes Connect Application State shows as Metadata Rejected, we don't require a new binary to correct this issue. Please visit iTunes Connect, Manage Your Applications. Select your app, then click View Details of the desired version. Click the Edit button next to Version Information to edit the Review Notes for your app, then click "Save". 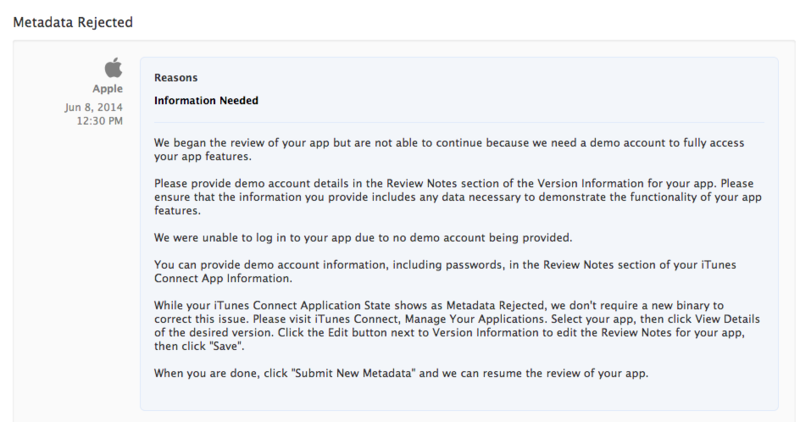 When you are done, click "Submit New Metadata" and we can resume the review of your app.